The magazine you’re reading was founded in 1985, in response to new developments in home studio recording. The availability of affordable multitrack tape recorders, sequencers, mixers, synths, samplers and drum machines meant that it was suddenly feasible for musicians to record their own music to a high standard, with increasingly sophisticated production values. However, like all revolutions, the home studio revolution did not come from nowhere. Audio recording had been a popular hobbyist activity since the 1950s. Mainly the province of hi-fi buffs, the focus was on capturing live performances to tape, and there was very little crossover between the equipment used in studios and that available to enthusiasts. To the audiophiles of 60 years ago, a Grundig moving-coil microphone might have represented a week’s wages, but you’d never have found one in Abbey Road. Today, they litter the shelves of junk shops, while once-prized reel-to-reel recorders are scavenged for parts and thrown away. However, the enthusiast recording market of the ’50s and ’60s did produce a few gems that are still valued. Danish hi-fi manufacturers Bang & Olufsen have always been known as much for the distinctive styling of their products as for their sound, and for many years, they marketed a range of ribbon microphones that both looked stunning and sounded much better than most of their contemporaries. All B&O ribbon models carried the prefix ‘BM’; it seems there probably never was a BM1 or a BM8, though the company made moving-coil mics designated the MD1 and MD8. From the BM3 onwards, they all shared a similar and very striking visual aesthetic, with the ribbon motor placed inside a cylindrical metal body. In the BM3 and BM4, which were both mono microphones, this body sprouted ‘ears’ on either side, which housed the magnets. These ears disappeared in the final generation of B&O ribbons: a mono mic called the BM6, which could be turned into a stereo mic known as the BM5 through the addition of a second mono element called the BM7. These mics had more high-frequency extension than the BM3 and 4, but were rather more delicate in construction, with several key parts being made of brittle plastic. If all of these models look familiar today, it’s because many of the design ideas pioneered by Bang & Olufsen are still current. It’s no accident that the Royer microphones bear a close visual resemblance to these forebears, and there are innumerable cheaper copies of Far Eastern origin doing the rounds. The subject of this review is likewise inspired by the Danish classics. Through his repair business Xaudia, Stewart Tavener will be well-known to many SOS readers in the UK. Stewart is one of the country’s leading specialists in restoring classic ribbon mics, and more B&O mics have been in pieces on his workbench than you or I have had hot dinners. So, when it came to starting his own manufacturing business, he too looked across the North Sea for inspiration. Both the model name and the appearance of his BM9 are obvious homages to Bang & Olufsen, and especially to the BM3, but this is much more than a simple reproduction. Although original B&O mics in good condition are still useful and characterful microphones, they are far from perfect. Unlike typical Coles and RCA models, they have relatively small magnets, and these tend to become partially demagnetised over time. This means that the never-stellar sensitivity of the BM-series mics has typically declined to the point where they are now only usable on drums and other loud sources. Many of them also have output transformers that are not really optimised for interfacing with today’s preamps, and in place of pure aluminium, B&O used an alloy called Duralinum for their ribbon material, which is susceptible to corrosion. Oh, and B&O would never fit a standard connector if they could find one that no-one else on the planet used. From left: the BM2, BM3, BM6 and the stereo BM5.Photo: Adam WatsonThe Extinct Audio BM9 thus incorporates a number of improvements over the BM3 after which it is styled. Of these, the main ones that are visible from the outside are the XLR connector and the grille, which is slotted vertically rather than horizontally; this allows some variation in the length of the different slots, helping to mitigate diffraction effects. Internally, the differences are more profound. Extinct Audio’s ribbon motor is more refined than the B&O originals, with a wider frequency response, and uses modern rare-earth magnets, giving it a stronger magnetic field and consequently higher sensitivity; and the ribbon is made of pure aluminium. The important bits of the BM9 (which, like the B&O models, is a passive design) are all hand-made in the UK, including the ribbon motor and the output transformer. In fact, since the latter is made specially for the BM9, Stewart offers the option to vary the output impedance for anyone who wishes to do so. The stock transformer provides a 300Ω impedance at 1kHz, which should be well suited to the preamps in typical modern mixers and audio interfaces. The mic body is beautifully made and finished in a striking matte satin, and a lovely wooden case with ammonite logo and magnetic clasp adds to the overall impression of class. The BM9 also comes with a simple but effective shockmount, which securely holds the microphone in place through friction, making it easy and quick to set up and position. My only quibble is that there’s no room for this mount inside the case, which I’m sure will result in many shockmounts getting separated from their attendant BM9s. Stewart is all too well aware of the pitfalls involved in microphone measurement, not least of which is the difficulty of finding a suitable figure‑8 measurement mic to act as a reference. As a result, he has been wary of publishing ‘specifications’ for the BM9 which might turn out to be unfounded, but is able to compare individual specimens to supply matched pairs. He also confirms that the mic does have a fully symmetrical figure‑8 polar pattern, and is thus suitable for use in Blumlein and Mid-Sides arrays, and says that its frequency response should be considerably more extended than that of the B&O mics it is based on, and comparable with typical modern ribbons from the likes of Royer. The proof of the pudding is, as always, in the eating. So how does the BM9 actually sound? Though I don’t own an original Bang & Olufsen BM3, I do have several of the slightly later BM5 stereo mics, one of which has been experimentally modified by Stewart himself, with the original magnets replaced by modern neodymium ones. ‘Before and after’ comparisons on this mic showed us that increasing the strength of the magnetic field doesn’t only increase the sensitivity of a ribbon microphone: it can also change the sound to a surprising extent. As the field gets stronger, it begins to inhibit the ribbon’s ability to vibrate at low frequencies, and beyond a certain point, bass response audibly suffers. This certainly isn’t a problem with stock BM5s. 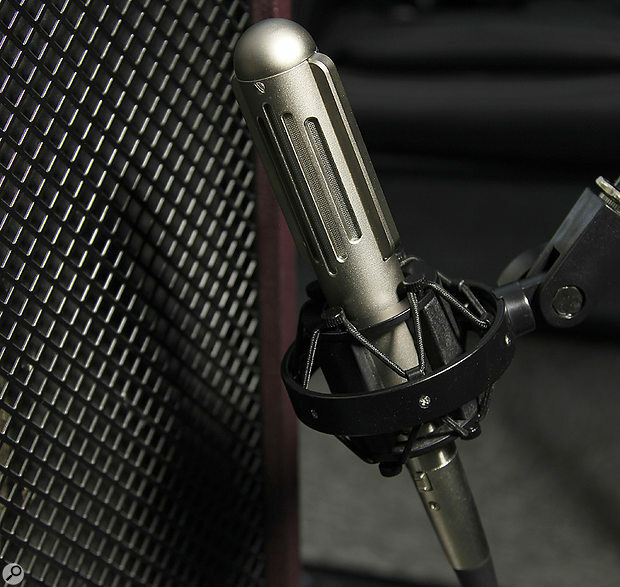 Vintage ribbon mics typically roll off at the top and bottom, especially when used at a distance, but the BM5 delivers a serious amount of welly in the 100Hz region and below. This can be interesting when used as a drum overhead or room mic, but it can also get completely out of control! By contrast, the modified BM5 sounds a bit choked at the low end, and tends to make drums sound very ‘blatty’; it is, however, much more sensitive, and thus usable on quiet sources such as acoustic guitar or voice. Both mics have their uses, but what surprised me about the Extinct Audio BM9 is how much better it sounds than either. At the low end, it definitely has a deeper bass response than many vintage ribbons, but this is both more manageable and more natural than that of the unmodified BM5. The thump that the BM5 produces when you put it within 100 yards of a kick drum is impressive, but it’s also rather uncontrolled and ringy, as though partly the result of an undamped resonance. The same drum recorded on the BM9 still hits you in the guts, but it’s a short, sharp, articulate punch rather than an unfocused ‘boom’. The mid-range definitely has a B&O‑ish quality to it, but is noticeably smoother and more refined, perhaps with a slight thickness in the 400Hz area. This is easily tamed with EQ if it’s too rich, and whereas all of the original BM-series mics struggle to put across much information above 10kHz or so, the BM9’s greater extension is obvious, with a palpable sense of air and space at the top end. It’s a great drum overhead or room mic, but it also works well in all the other roles where you might traditionally use a ribbon. A friend put them up next to his Coles 4038s as room mics for upright piano; the Coles had even more going on below 100Hz, but the BM9s had more air, and a nice bite to the upper mid-range that would help the instrument cut through in a mix. I had the review BM9s on loan for a couple of months, and on every occasion where I needed either a figure‑8 microphone or a characteristically ‘ribbon‑y’ sound, they stepped up and delivered the goods. Not only do they sound great, but like the original Bang & Olufsen designs, they’re stylish, lightweight and easy to position — and unlike the originals, they’re built like a tank, and usable on quiet sources. In short, the BM9 presents a very nicely judged balance of the classic and the modern, at a price level you don’t normally associate with ‘boutique’ microphones. I have bought the review pair, and at least one of my old BM5s will be making its way onto a well-known auction site very soon! The strip of foil that forms the ribbon in a ribbon microphone has to be corrugated in order that its tension can be adjusted appropriately. In most ribbon mics, including the BM9, the corrugation consists of a simple zig-zag pattern running most of the length of the ribbon. In the original BM-series mics from which the BM9 takes its inspiration, however, Bang & Olufsen did things differently. Their ribbons used a so-called ‘pistonic’ arrangement, whereby the main part of the ribbon is corrugated crossways, and zig-zags appear only at either end. Opinions differ about how much difference the corrugation style makes to the sound of a mic, but most agree that there is a difference, and it is certainly more significant than, say, the composition of the ribbon material. 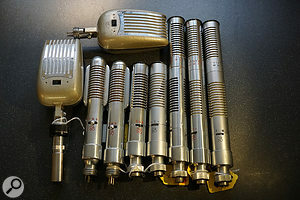 Incidentally, the pistonic approach is also used in Beyer’s ribbon mics, but few third-party repairers seem able to replicate it; so when you see second-hand Beyer mics advertised as “upgraded with new ribbons”, be aware that this is a doubtful usage of the word “upgrade”. We are living in something of a golden age for ribbon mic design, and if for some reason the Extinct Audio BM9 doesn’t float your boat, there are excellent alternatives available at around the same price from Rode, Audio-Technica, Samar, Sontronics, Royer, Beyer, Cloud and more. Of the ones I’ve tried, I’d highlight the Rode NT-R and Samar VL37 as being particularly special. However, you could also look around for an original Bang & Olufsen ribbon microphone. They are fairly common, at least in Europe, and regularly appear for sale on sites such as eBay. If you do, there are a few things to bear in mind. First of all, as mentioned in the main text, the magnets tend to lose their potency over the years, and the Duralinum ribbon material can corrode and become stiff. So, even if you are lucky enough to find one in working order, it won’t be operating to its original specifications, and in practice, may be usable only on loud sources such as drums and electric guitar amps. This is doubly so with the BM2 and BM3, which had a 50Ω output impedance. Second, note that each model has its own Achilles heel. In the BM2, 3 and 4, it’s the output connector, which is unique to B&O and difficult to obtain. If you buy one without the matching cable, repairers such as Xaudia can replace them with XLRs, but it’s not a trivial job. The later B&O mics have a five-pin DIN with a locking ring on the mic rather than the cable; this flouts the convention adopted by almost every other mic with a DIN connection, but in practice, a standard DIN socket will mate pretty snugly. More of a problem with these mics is the brittle plastic used in some key components, including switches and the spacer that attaches the BM7 to the BM6 to make the stereo BM5. Be sure that these parts are in good condition before you buy, as they may be difficult or impossible to replace. With the possible exception of these plastic parts, everything else about the BM-series mics can be rectified by throwing enough money at the problem, and indeed, Stewart usually has a few refurbished models for sale on the Xaudia web site. But having tried his BM9, and some of the other mics mentioned earlier, I’d say it’s not worth spending the same amount of money on buying and restoring a B&O mic. The new mics are just better, and you’ll benefit from manufacturer support, a functioning standmount and guaranteed consistency from mic to mic, none of which are on offer with original B&Os. 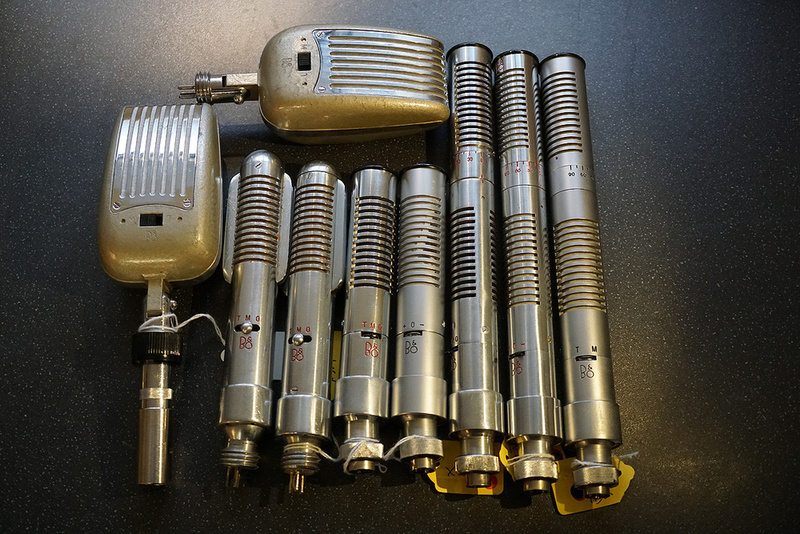 It’s better to think of them as beautiful and quirky pieces of microphone history, worth snapping up if you see them on offer cheaply at car-boot sales (and especially if you can find a BM5 with the beautiful wooden case that was available as an option), but not directly comparable to the Royers of this world. 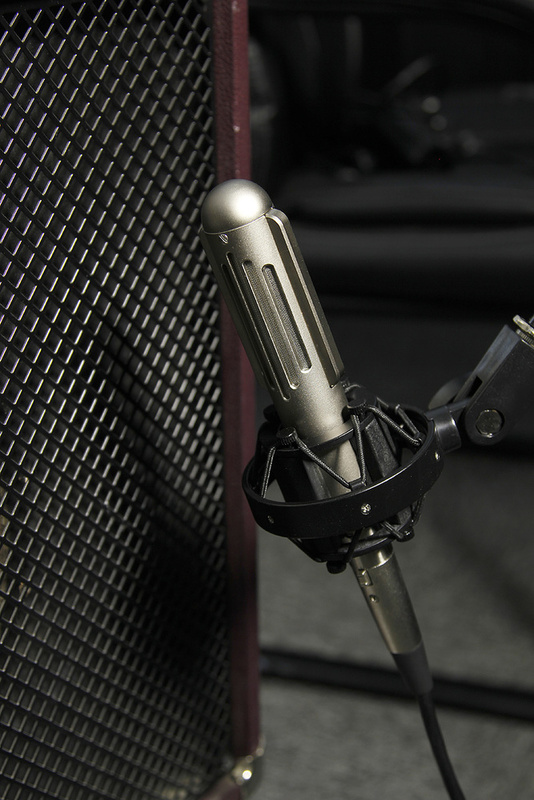 Sounds like a classic ribbon mic, but with better high- and low-frequency extension. Relatively strong output level for a passive ribbon mic. Beautifully made and supplied in a very attractive box. Small, light, and easy to position. Shockmount won’t fit in the box! Extinct Audio have brought the classic Bang & Olufsen ribbon design into the 21st Century, with impressive results. The BM9 has a sound character that is noticeably reminiscent of the Danish original, but with its higher output, smoother frequency response and greater ability to capture sound at either end of the spectrum, it’s much more usable in the modern studio. £599 including VAT. Extinct Audio are offering 10 percent off the first ten orders made by SOS readers until the end of April: use the code SOSAPR18 in their online shop. £499 plus tax and shipping (total approximately $699 at time of going to press). Extinct Audio are offering 10 percent off the first ten orders made by SOS readers until the end of April: use the code SOSAPR18 in their online shop.